Melt the soap over a double boiler. Keep it covered with a lid to avoid loss of moisture. Alternately, you can melt the soap in a low powered microwave. Put it in a bowl, covered and microwave for 3-4 minutes stopping and gently �pushing� the cubes around halfway through -DO NOT STIR! This will create air bubbles, which are difficult to get rid of. The other trick is to not let the soap get too hot � Don�t be in a big panic always use a low to medium power. NOTE: Bulk soap usually has around 12-13% water in it, and the process of melting evaporates that water out. If you were to melt the soap, let it harden and remelt it again and again, eventually the soap would loose its moisture and become flaky or waxy. Powdered or ground colorant � think of it as making gravy. Don�t add it directly to the entire batch of soap or you will get lumps of colour. Rather, separate a small amount of soap out into a dish, add the colorant until it is like a paste and then stir this paste back into the main pot. Anywhere from 1/16tsp. to �tsp. Per pound of soap. Liquid colorant � can be added directly to the soap pot (bowl) start with � tsp. and go from there. With Day-Glo colorants � the more you add doesn�t make the colour nicer � you just want to tint the clear base. This is easy; because you are working with a quality soap base you can add just about anything (meaning fragrance oil or essential oil) Even YOUR favourite perfume. How much to add, generally depends on your preference. Start with about � tsp per pound and work up from there. Some essential oils and fragrance oils are quite strong, some quite mild � it�s all in your individual taste. This has become very popular! It is similar to suspending except you pour the liquid base into a mold and then wait until you see a skin forming/ once the skin forms in the mold, place the embedding object on top, gently without breaking the skin � spray with rubbing alcohol, and pour the remaining soap over top. To reduce bubbles on top � spray with rubbing alcohol again or cut off when cooled. Something like Cadbury chocolate bar! You will want to prepare the soap as usual. After you have added the fragrance and colorants, remove the pan from the heat and cover with a lid. Let the pan sit until the outside is just warm to the touch. While it is cooling, organize you additives and spray with rubbing alcohol. This will encourage adhesion and dissolve bubbles that may form. Next, be prepared to work quickly. Once the pan is cool to touch remove the lid. Stir in your suspended item. Stir consistently but slowly (don�t create bubbles) and then pour into your molds. Remember that some flowers may turn brown. Suspending herbs is an art that you will need to perfect. Ground oatmeal is an easy additive that creates a wonderful scrub when suspended in soap! You can customize your soap by adding small amounts of skin loving ingredients to your soap base � this is why we call it crafting! The general rule of thumb is approximately � cup of any liquid (other than oil) to 1 pound of soap base and up to 2 tablespoons of any oil. Be creative � some suggestions for liquids could be herbal teas, coffees, milk, cream etc. Oils can be any liquid or solid oils (solids would have to be premelted) and honey. NOTE: as with scents, your additive oil could affect the final appearance of your soap. This takes on the same principal as layering, except you melt the soap base in two separate pots (bowls) � add colour, fragrance, additives etc. to each pot and when the soap cools to a slight skin on the top, mix it back in and pour BOTH soap bases into the molds at the same time. The trick to layering soap is getting the layers to stick together. First, pour the first layer and let it cool just until it is firm enough to support the weight of the next layer. Spritz with rubbing alcohol and then pour the second layer. The alcohol will encourage adhesion. You can repeat this as many times as you would like. You can use just about anything here. 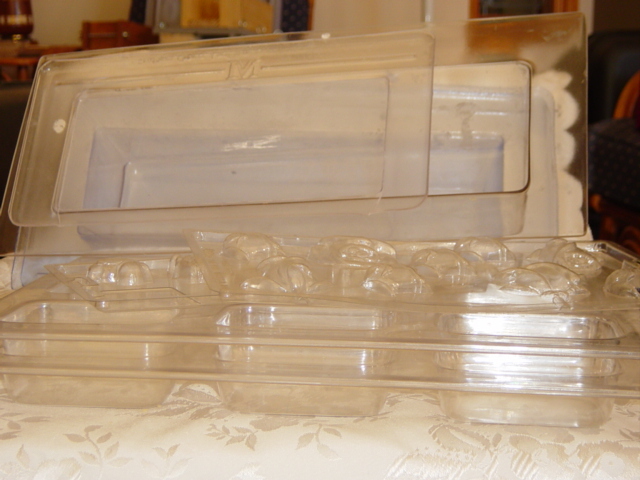 From yoghurt containers, muffin tins and Tupperware to a store bought mold. Just grease and pour the soap in! Anytime you are having trouble releasing the soap from the mold � pop it in the freezer for � hour � let it sit for a few minutes or place it in a shallow dish of hot water � then pop it out. Because your soap is high in emollient glycerine, it is best to wrap it in plastic wrap until it is to be used. Cello bags tied with raffia are also a great way to give your soap a �professional� look. The soap that you create is only limited to what you can think of � have fun!